PRIVATISATION OF DEER MANAGEMENT ON STATE LANDS? 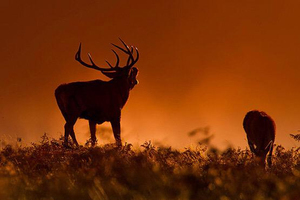 Wicklow Sika stag: is management of deer on State lands to be privatised, and if so, what will be the effect on deer populations and on the ordinary licensed hunter? The Department of Agriculture, Food & the Marine has published a Request for Tenders (RFT)for the provision of deer management services in the Co. Wicklow region. The tender calls for the establishment of at least three deer management units in the Wicklow region to include the development of deer managements plans for each of these groups and implementation of these plans over a three-year period. The contract is valued at €120000.00 (excluding VAT) over the three-year life of the contract. The RFT was published on 1st February 2018 with a closing date for tenders of 12.00 noon on 8th March 2018. All queries relating to the tender must be submitted not later than 12.00 noon on 24th February 2018. Full details of the RFT are available on the Government’s eTenders Procurement website, www.etenders.gov.ie. Parties tendering for this contract will be required to satisfy stringent criteria as to competence, experience and the structural capacity to fulfil the conditions of the contract. They will be required to carry Employer’s Liability, Public Liability and Professional Indemnity Insurance, and to be fully tax-compliant i.e. to possess a current Tax Clearance Certificate. The areas targeted as Deer Management Unit (DMU) zones are not identified. There is no indication whether the successful contracting party will be permitted to operate outside the normal hunting framework e.g. whether night shooting will be permitted, whether Closed-Season shooting will be permitted as a matter of course under Section 42 licences, or, where Coillte forest property is involved, whether ordinary hours of access only will apply (dawn to 11.00 a.m., Saturdays, Sundays and Public Holidays) or whether use of vehicles will be permitted. There is no mention of what is to happen to culled deer e.g. whether they become the property of the contracting party and accrue to his benefit financially. There is provision under the ordinary terms of any Government contract for the involvement of sub-contractors, which may allow the contracting party to achieve financial benefit from allowing downstream persons (e.g. individual hunters) to participate as members of any deer management group operating in one or other of the DMUs. Finally, the contracting party will be expected to produce and maintain a Deer Management Plan for each DMU in accordance with the precedent set out at Annex B of the tender documentation. The full tender documentation (72 pages total) can be accessed only by registering as a User on the eTenders website. a) Tenderers must provide a detailed description of the operations; resources; and methodology to be deployed to meet the requirements and the specifications. Tenderers must demonstrate in their replies that they have knowledge and expertise in delivering similar services and that the proposed approach is consistent with best practice. b) A detailed project management plan should be included in the tender reply showing clearly the various steps/stages in the process including timelines and milestones for delivery. The project plan should state that the tenderer will comply with the principles set out in “Deer management in Ireland, A framework for action”. d) A payment schedule should also be set out in the tender reply tied to project milestones. • Establishment of at least 3 deer management units (DMU’s) in the County Wicklow region (this may include parts of south County Dublin north County Wexford and east County Carlow see Annex 1 map). • Preparation and implementation of structured deer management plans for each of these deer management units (a single management plan can cover all DMU’s). Such should represent a collaborative action plan between landowners, hunters and key stakeholders and should be an active document insofar as records are logged and used throughout the 3-year management period for key decision making. following hunting seasons and keep the Irish Deer Management Forum (IDMF) updated on progress. It is suggested that this proposal will put sustainable deer management within the county on a more professional basis and promote knowledge transfer in the county, as well as mainstreaming of the project and sharing of knowledge where required outside Co. Wicklow. • Description of actions undertaken to increase awareness for landowners around the mechanisms for control and management of deer both within the project area, and in surrounding areas. • Outline of implementation (across all DMU’s) of impact assessment method on grass and forests. • Establishment of baseline data and objective damage levels using the standardised measuring techniques specified. And monitor damage levels over the 3 years period. • Analysis of the work completed in the past three years, what worked well, what didn’t, what improvements could be made to the collaborative DMU approach to deer management. Conclusions and recommendations for the future should be included.